Thebes is a city in central Greece, the biggest city in the Boeotia region. Travelers today can visit its Archaeological Museum and various ancient ruins there. It’s a busy market town, not far from Athens. Thebes was also an important location for many Greek myths involving various gods and goddesses, including Oedipus and Dionysus. It’s also the birthplace of the Greece hero, Hercules. Even the name of Hercules starts out like "hero." Let's take a closer look at the strongest semi-divine man of ancient Greece and meet the archetype of the modern superhero. Appearance: Handsome, well-built, a vigorous, young but not boyish man, often bearded. Symbol or attributes: Wooden club, his well-developed muscles, a lion skin which he wears over one shoulder after completing Labor No. 1, noted below. Weaknesses: Can be lustful and gluttonous and prone to intoxication at times. Birthplace: Son of Zeus by Alcmena or Alcmene, born in the Greek city of Thebes. His first "stepfather" was Amphitryon. His second stepfather and mentor was Rhadamanthus, the just and law-giving brother of King Minos of Crete, who was also a son of Zeus. Spouse: Megara; after his deification after death, Hebe, Olympian goddess of health. Children: Many; supposedly he had a child by each of the fifty daughters of Thespius. Some accounts claim that was only one night's worth. His three sons by Megara are Therimachus, Creontiades, and Deicoon. Interesting fact: Hercules' name means "Glory of Hera," though Hera is his implacable enemy. This may hark back to an earlier story where Hercules may have been the son or the lover of Hera. The goddess Athena, on the other hand, regards him kindly, as does his father, Zeus. There is a small, ruined temple to Hercules at the Oracle site of Dodona in northwestern Greece, where his Dad, Zeus, is popular. The city of Heraklion, Crete, is said by some to be named after Hercules, who did have some ties to Crete but may be named after Hera instead. He is also associated with the ancient Cretan city of Phaistos, ruled or founded by his stepfather Radamanthes, and was featured on early coins issued by the city. The mythological stories associated with Hercules are numerous. 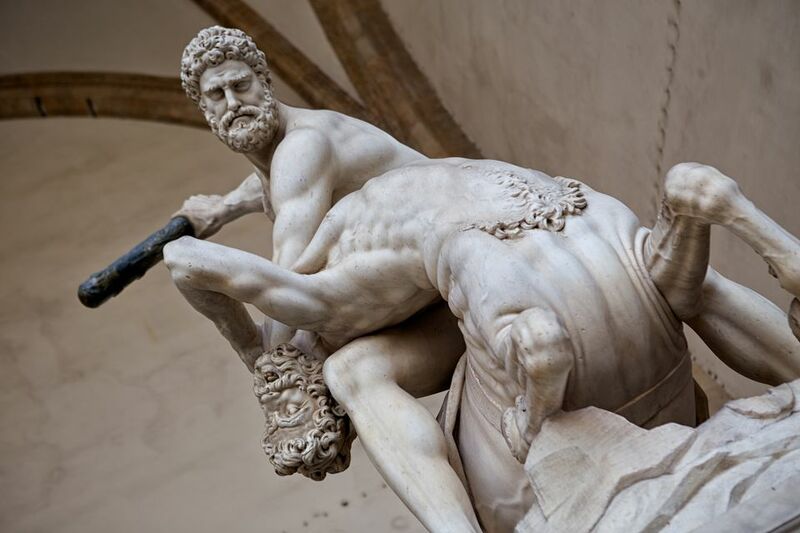 The Labors of Hercules vary in number, but are most often 10 or 12, and depending on the source the lists of his labors include different tasks. Hercules was set on these labors by the Oracle of Delphi, possibly to expiate his guilt over killing his wife and children in a fit of madness sent by the goddess Hera, and the labors were part of his service to King Eurytheseus. He was undaunted by any of them and triumphed in each instance. Conquer and deliver the Nemean Lion, a monstrous feline ravaging the countryside. Bring back, dead or alive, the Cerynitian Hind, a ravaging deer. Clean out the massive stables of Augeas, perhaps the most famous of the Labors. Scare off and kill the metal-feathered Stymphalian birds. Capture the Cretan Bull, another ravager of the local countryside. Do something about those pesky man-eating Mares of Diomedes (he moved them and released them). Get the Girdle of Hippolyta, Queen of the Amazons (she gave it to him peacefully, which enraged Hera, who arranged for the rest of the Amazons to attack Hercules; in the mess that followed, Hippolyta was killed by Hercules). Steal the cattle of Geryon. Bring back the Golden Apples of the Hesperides. Go down to the Underworld and bring back multi-headed Cerberus, chief Hound of Hades. Hercules enjoyed dozens of other adventures and was beloved by the Greeks. His worship later spread to Rome and the rest of Italy. A popular TV series took him on many more, increasingly unlikely adventures, but even in ancient times, Hercules was an inexhaustible source of entertaining tales, so they're not that far off.